The 4 x 3 Noa Axi Playhouse is a high quality, but low priced playhouse that would serve very well as a first playhouse for a child. Younger children are really going to have an amazing time with this and they are going to want to spend as much time as they can in here with their friends and even their best teddy bear friends. It is an ideal size in that there is plenty of room for them to play, but at the same time this is not going to take up a whole lot of real estate in the garden. The playhouse has two opening windows and a really cool looking barn style door that will make the kids think they are some kind of cowboy or cowgirl. Kids like to play a little bit rough and this playhouse has been designed with that in mind. 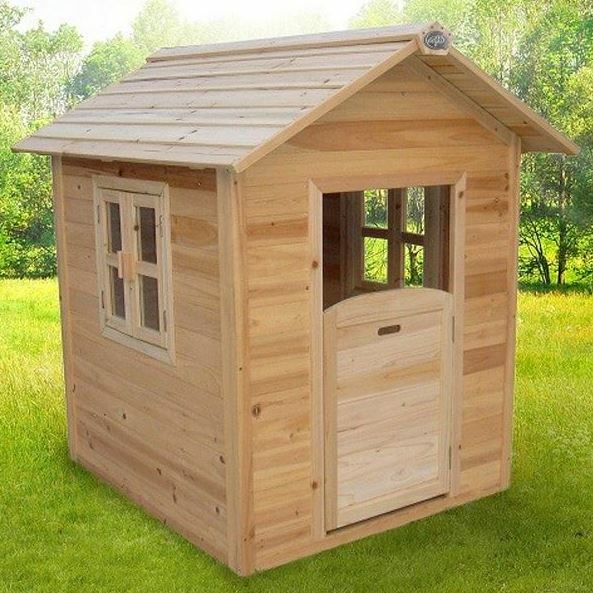 Tongue and groove shiplap cladding is backed up by a 38 mm thick frame that makes this an incredibly robust structure. The windows are also very well made in that they close securely thanks to a magnetic catch. Even the roof is made in a very impressive way as instead of using felt, tongue and groove boards are used for the roof. The 4 x 3 Noa Axi Playhouse would work very well as a child’s first playhouse. It has a fantastic and friendly look to it and we are sure you are going to be saying aww an awful lot when you see your kids playing inside it. 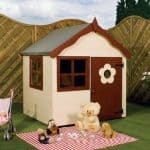 One of the things that we love about this playhouse is how it is an ideal size for younger children. It will feel large to them, but it is not going to take up the whole garden. The width of the playhouse is 4 feet 5 inches this is the size of the actual structure so the inside is just a few inches smaller than this. The depth is 3 feet 3 inches and this compact depth is going to make it fit into even smaller gardens very well. Height wise, kids will have plenty of headroom as there is an impressive, 4 feet 3 inches of headroom. 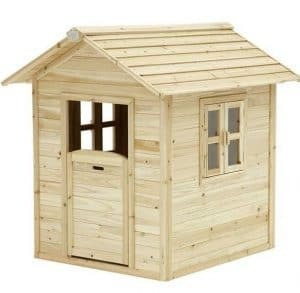 Axi have one of the best roofs on any playhouse, we have seen them use this wooden, tongue and groove style roof before and it never fails to impress us. An apex roof is always going to prevent rain from getting inside as the angle of it prevents it from sitting and pooling on top. 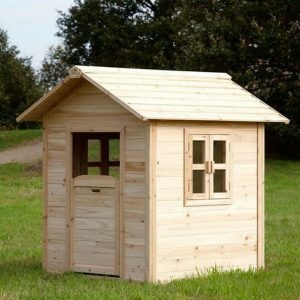 The 15 mm tongue and groove shiplap cladding is some of the thickest cladding we have seen on any playhouse or shed for that matter. The cedar wood has a fantastic look to it and we really do like how smooth and stylish it is. As well as the clearly attractive design of this cladding it is also very practical as it will keep the bad weather out very well. Something that we have seen a few times from this manufacturer now is the 38 mm timber frame. This is just so solid and it will be what makes this a playhouse that your kids can use for lots of years. Not only that, but we see this playhouse something which could be passed down to younger siblings or other family members as this frame will stay in tip top shape for many years. Now for the flooring, well there is no floor. 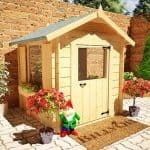 This playhouse will just sit on the grass, concrete, decking or whatever surface you have. This is both good and bad, good in that this is part of the reason the playhouse is able to be sold at such a low price. Bad because if you only have grass, you most likely will not want that as a floor and have to figure something out like perhaps purchasing some cheap boarding for it to sit on. Treating the playhouse is essential if you want to keep the wood free from rot. We always suggest that wood treatment should be applied within a week of installation. Also a fresh coating once a year is something you will want to do to ensure no rot or any other issues arise with the wood. Axi give you a very generous five year warranty. This will cover you against rot and any insect damage that may occur. There is a very interesting door on the 4 x 3 Noa Axi Playhouse. They have used a swinging barn style door and in many ways it resembles the kind of door you would see on an old Western saloon which will be ideal if your child wants to pretend to be Woody or Jessie from Toy Story. We really do love the look of this door, but it does leave part of the playhouse exposed to the elements which may concern some people. It will certainly make you not want to leave more expensive items inside here. Each side of the playhouse has a window and we really do like what they have done with these windows. These windows can be opened and they close with a very clever magnetic catch which makes them shut very securely, but it also means the kids will be able to open them very easily. The windows are glazed with acrylic, but this is very high quality acrylic that is shatterproof. To be honest with you, we are very surprised that they were able to have these windows on the playhouse and keep the price so low. While the windows will securely shut very well that awesome looking stable style door does leave this playhouse a little bit open which may worry some of you. We though see this as a playhouse that is made for younger children so we see it as most likely, you will not have many expensive things in here anyway. 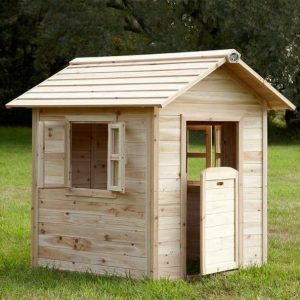 Not a great deal of privacy is on of privacy is offer with this playhouse, but again like the lack of security, we do not see it as a major issue and it is certainly not something we are going to put the playhouse down for. 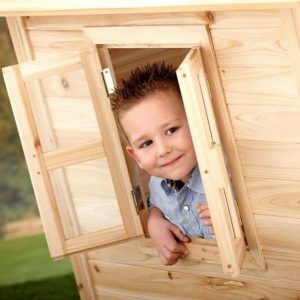 We find that little kids seem to love to show off their playhouses so if anything they will love that people want to check it out. 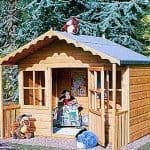 Axi do not offer any kind of customisation with this playhouse as it is fine just the way that it is so we really do not mind. If you wanted to jazz it up a little bit then one way to do that is with a coloured wood treatment. 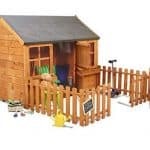 There are a few extras with this, to start with there’s an anchoring kit that would be ideal if you are a little bit worried about this blowing over in the wind, last thing you want is an angry neighbour at your door saying the playhouse is in their yard, this costs, £54.95 which we feel is a fair price. There is also an extra that is not essential, but the kids will really love it. This is a chalkboard that costs, £39.95 also there plant and flower box so they can decorate the playhouse with a little plant life, this costs, £34.95 and would be a great way to get your kids into gardening. 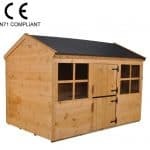 Axi are fast becoming one of the very best playhouse manufactures when it comes to making high quality playhouse at low prices. We can see this lasting for many, many years and apart from a coating of treatment there really is not a lot of upkeep required here. This is one of the smaller playhouses that is out there, but this is made for younger, smaller children so really the size is ideal in that regard, but kids may outgrow this quicker than they would a larger playhouse. You will need help from a friend or a family member, but this will not cause you any headaches. Instruction are included and with the odd tea break, 4-6 hours is roughly how long this will take to build. At under £200 and for how high quality this is, we really do feel that this is excellent value for money. 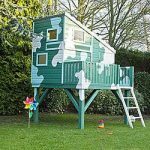 Final Thoughts: Choosing a child’s first playhouse can be tricky as you want something that is going to be able to take the rough and tumble that kids like to do, but you also want it to be easy on the eyes as it is going to be living in your garden after all. Well the 4 x 3 Noa Axi Playhouse would be a fantastic first playhouse for a younger child and it also has an adorable look so it is going to stand out in a very positive way in your garden. 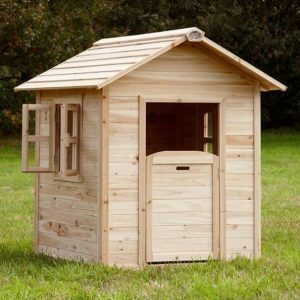 While we would really have liked a floor to be included at the end of the day that is not something we see as a deal breaking and if you want a high quality and low priced playhouse for your child or grandchild then we highly recommend you consider this.